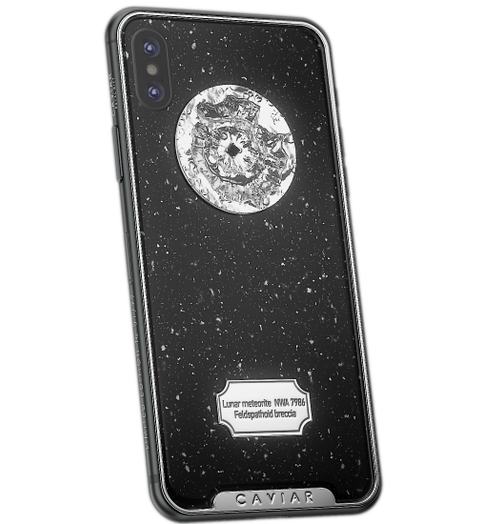 Space Moon Design of this cosmic phone is a contrast combination of white and black marble background, so familiar to anyone who has ever admired the full Moon in the starry sky. 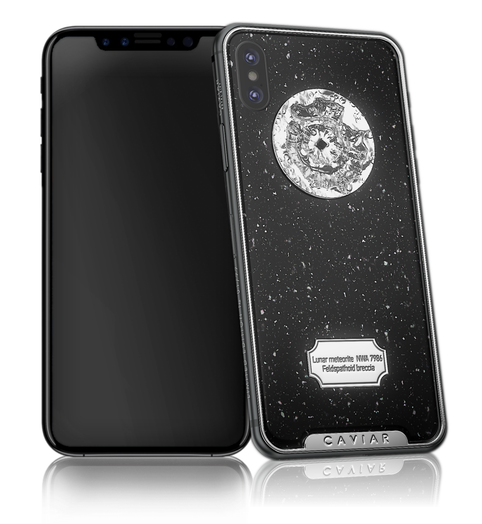 Caviar's designers have combined the white elements representing the Moon's surface and a composite marble serving as noble and magnificent background to show beauty, greatness, and inaccessibility of the Moon. A special design detail is a tiny piece of the Moonstone enclosed in original gold-plated crater. This find was detected in the Northwest Africa in 2011 and its authenticity is guaranteed by the UK Society of meteoritics. The space Odyssey of Caviar's designers focused on the Moon, the natural Earth satellite. And that's not a casual accent: the Moon influences ebbs and flows on Earth, affects life cycles of organisms on our planet, and symbolizes immortality, revival, and abundance in all cultures; therefore, design of exclusive Caviar «Space Moon» phone is made for influential and authoritative people preferring impressive designs and extraordinary modern solutions. 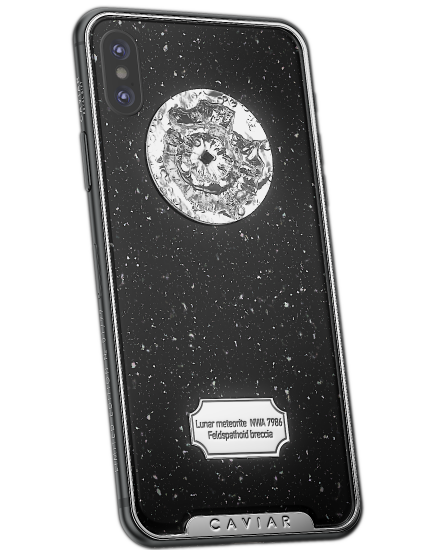 Design of this cosmic phone is a contrast combination of white and black marble background, so familiar to anyone who has ever admired the full Moon in the starry sky. 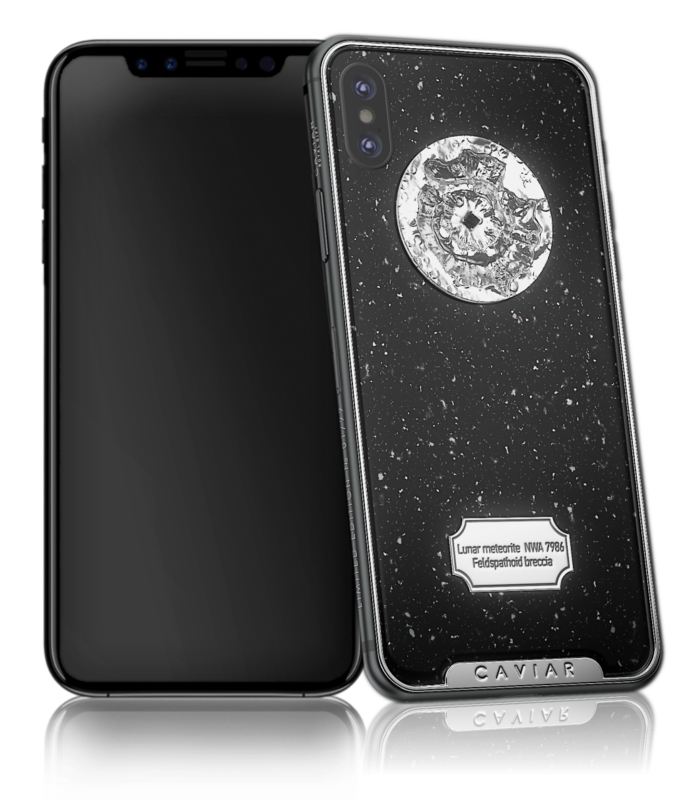 Caviar's designers have combined the white elements representing the Moon's surface and a composite marble serving as noble and magnificent background to show beauty, greatness, and inaccessibility of the Moon. A special design detail is a tiny piece of the Moonstone enclosed in original gold-plated crater. This find was detected in the Northwest Africa in 2011 and its authenticity is guaranteed by the UK Society of meteoritics. The space Odyssey of Caviar's designers focused on the Moon, the natural Earth satellite. And that's not a casual accent: the Moon influences ebbs and flows on Earth, affects life cycles of organisms on our planet, and symbolizes immortality, revival, and abundance in all cultures; therefore, design of exclusive Caviar «Space Moon» phone is made for influential and authoritative people preferring impressive designs and extraordinary modern solutions. Fragment of the Moon from lunar meteorite NWA 7986, relief crater. White Double electroplating (7 micron). Double white coating by Double Electroplated technology (24-carat, 7 microns). Inscription with meteorite type designation.